Use this instruction sheet when installing the above water pump repair kit on 2009 and newer Evinrude E-TEC® 25 – 30 HP outboards. DO NOT install on any other models. Indicates a hazardous situation which, if not avoided, will result in death or serious injury. NOTICE Indicates an instruction which, if not followed, could severely damage engine components or other property. For safety reasons, this kit must be installed by an authorized Evinrude®/Johnson® dealer. This instruction sheet is not a substitute for work experience. Additional helpful information may be found in other service literature. DO NOT perform any work until you have read and understood these instructions completely. Torque wrench tightening specifications must strictly be adhered to. Should removal of any locking fastener (lock tabs, locknuts, or patch screws) be required, always replace with a new one. When replacement parts are required, use Evinrude/Johnson Genuine Parts or parts with equivalent characteristics, including type, strength and material. Use of substandard parts could result in injury or product malfunction. Always wear EYE PROTECTION AND APPROPRIATE GLOVES when using power tools. Unless otherwise specified, engine must be OFF when performing this work. 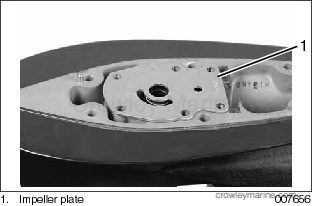 Always be aware of parts that can move, such as flywheels, propellers, etc. Some components may be HOT. Always wait for engine to cool down before performing work. This instruction sheet may be translated into other languages. In the event of any discrepancy, the English version shall prevail. TO THE OWNER: Save these instructions in your owner’s kit. This sheet contains information important for the use and maintenance of your engine. Remove gearcase from outboard. Refer to appropriate Service Manual. Remove the impeller housing screws. Pull up on the driveshaft and remove the driveshaft with the water pump assembly from the gearcase. Remove the water pump assembly from the driveshaft. 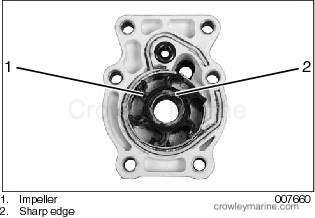 Remove the impeller plate and gasket. Discard the gasket. 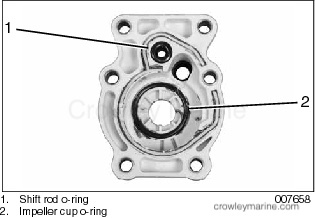 Remove the water pump grommet, all O-rings, and the shift rod bushing from the impeller housing. Check impeller for overheating, hub separation, and other wear or damage. Check liner and wear plate for scoring, distortion, and impeller material transfer. Inspect the housing for cracks or melting. Oil and install the shift rod bushing into the impeller housing. 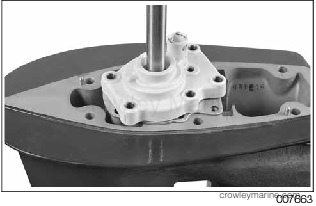 Apply Triple-Guard grease to the shift rod O-ring and install below bushing. Apply a thin bead of Adhesive 847 in the inner groove of the impeller housing and install a new impeller cup O-ring. Lightly coat the exterior of the impeller cup with Gasket Sealing Compound. Align tabs of impeller cup with location holes of impeller housing and install the impeller cup into the impeller housing. Lightly coat the inside of the impeller cup with oil. 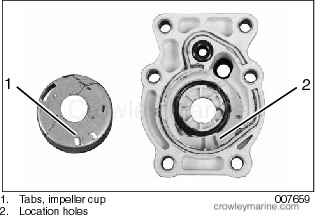 With a counterclockwise rotation, install the impeller into the impeller cup. 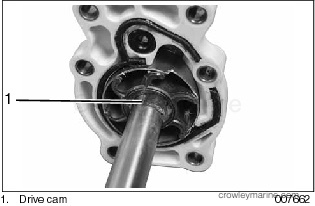 IMPORTANT: The sharp edge of cam slot in the impeller is the leading edge during rotation. 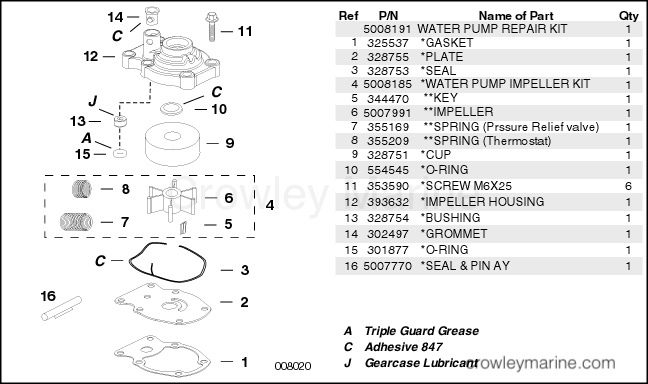 Apply Adhesive 847 to the outer seal groove of the impeller housing. Install a new seal into the groove. Lightly oil pinion splines of the driveshaft. 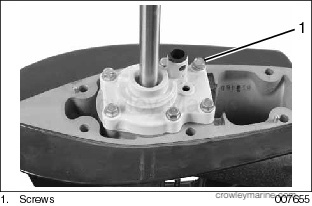 Slide the driveshaft through the impeller housing and impeller until drive cam flat of the driveshaft is below the impeller. 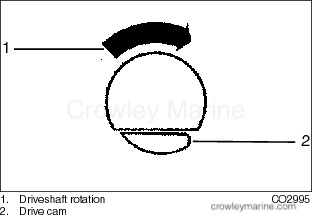 Align drive cam flat with groove of the impeller. Install the impeller drive cam. Sharp edge of the cam is leading edge during driveshaft rotation. Slide the impeller housing down the driveshaft. Engage the impeller with the cam. IMPORTANT: Make sure the impeller is oriented properly and engages the impeller cam properly. Serious powerhead damage will result if impeller cam is displaced. Lightly coat both sides of a new impeller plate gasket with Gasket Sealing Compound. Place gasket on the gearcase. Place the impeller plate over the gasket. Slide the driveshaft down into the gearcase and engage the pinion. 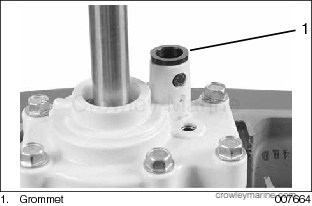 Turn the driveshaft until holes of the impeller housing are aligned with holes of the gearcase. Apply Gasket Sealing Compound to threads of the impeller housing screws. Tighten the screws to a torque of 60 to 84 in. lbs. (7 to 9.5 Nm). Apply Adhesive 847 to outside of water tube grommet. Install grommet and locate grommet bosses into holes of impeller housing. Install gearcase on outboard. Refer to appropriate Service Manual. Tighten gearcase mounting screws to a torque of 128 to 146 in. lbs. (14.5 to 16.5 N·m). 2010 and Older Models ONLY Install the pressure relief valve and thermostat springs provided with Water Pump Impeller Kit, P/N 5008185. 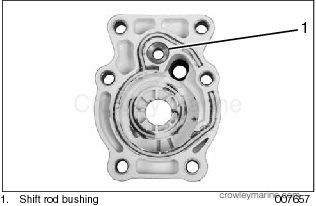 Refer to instructions provided with Water Pump Impeller Kit or appropriate Service Manual. A cold running engine, if the impeller is installed without the pressure relief valve and thermostat springs. An engine overheat, if the pressure relief valve and thermostat springs are installed without the new impeller. Start outboard. 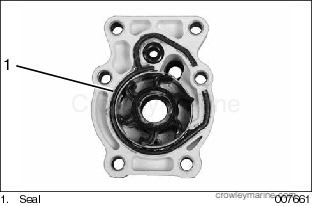 Check water pump operation. Check engine operating temperature. Refer to appropriate Service Manual for engine temperature check procedure. NOTICE DO NOT run outboard without a water supply to the outboard’s cooling system. Cooling system and/or powerhead damage could occur. Be sure the water intake screens are below the water surface.